Award-winning actress, singer-songwriter and director Zooey Deschanel wears the Classic Clog. British actress Natalie Dormer wears the Crocband Platform Clog. Chinese actress, dancer and model Gina Jin wears the LiteRide Sandal. South Korean actress and gugudan girl-band member Kim Se-Jeong wears the Crocs Serena Sandal. Japanese actress and model Suzu Hirose wears the LiteRide Clog. 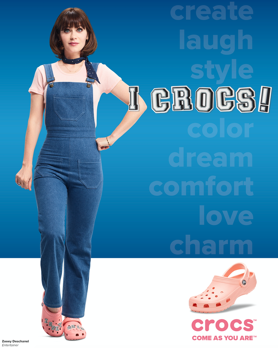 NIWOT, Colo., April 3, 2019 /PRNewswire/ -- Crocs, Inc. (NASDAQ: CROX), a global leader in innovative casual footwear for women, men and children, today launched the third year of its "Come As You Are" marketing campaign. Global brand ambassadors, including award-winning actress, singer-songwriter and director Zooey Deschanel, along with British actress Natalie Dormer will encourage consumers to declare that being yourself, being comfortable and looking stylish are not mutually exclusive. "Because comfort comes in many shapes and sizes, our global brand ambassadors will wear and talk about some of our most popular styles in settings that are relevant to their interests and personalities," Reilly said. Crocs' most popular products and collections will be showcased throughout the campaign, including LiteRide™, Crocband Platform, Crocs Serena, Swiftwater™ and, of course, the iconic Classic Clog. "Come As You Are" will be seen through various digital, social, print and in-store marketing materials with a specific focus on the United States, Germany, China, Japan and South Korea. In addition, Crocs will be on the lookout for a 2019 Crocs Fan Ambassador who can show how they embrace "Come As You Are" and wear Crocs to pursue their passions. Additional details on the 2019 Crocs Fan Ambassador contest will be shared later this month. Crocs, Inc. (Nasdaq: CROX) is a world leader in innovative casual footwear for women, men and children, combining comfort and style with a value that consumers know and love. A vast majority of shoes within Crocs' collection contains Croslite™ material, a proprietary, molded footwear technology, delivering extraordinary comfort with each step. In 2019, Crocs reinforces its mission of "everyone comfortable in their own shoes" with the third year of its global Come As You Are™ campaign. To learn more about Crocs or Come As You Are, please visit www.crocs.com or follow @Crocs on Facebook, Instagram and Twitter.